Competition in the mid-range 32in sector is always fierce. While Sony hasn't produced anything that exciting at this screen size for a while, it's good to see the Bravia KDL-32EX703 representing a stunning return to form for the manufacturer. Sony has done an admirable job of squeezing as much as possible into this panel, resulting in a spec list that's sure to cause some jealousy among its rivals. The main draw here is the Freeview HD tuner, which enables you to access subscription-free hi-def broadcasts. Along with Freeview HD capability, the TV boasts an Ethernet port that enables access to a host of internet widgets including YouTube and Dailymotion. The comprehensive line up of connections includes four HDMIs – two of which are side-mounted for easy access – as well as all the usual suspects and a USB port for playback of multimedia files. The KDL-32EX703 also boasts edge-lit LED backlighting along with the latest version of the manufacturer's Bravia Engine, including MotionFlow 100HZ processing and a sensor that switches the TV off if the room is empty for an extended length of time. This TV makes use of Sony's Xross system, a perfectly executed piece of onscreen ergonomics. Designed to enable access to other pieces of compatible kit – such as a PlayStation or Blu-ray player – the menu is arranged along two axes which may appear confusing at first but is actually extremely intuitive. The TV's remote control sports a chic design and although the buttons are rather small, they are clearly labelled and comfortable to use. While sets from many rival manufacturers appear to concentrate on delivering eye-popping levels of detail with forensic precision, Sony has concentrated on offering a natural, cinematic effect. Although this set does offer commendable sharpness, it avoids the hyper-real processing that some TVs employ, instead opting for a warm, more realistic look. The outstanding colour palette offers natural skin tones and realistic hues that can be brash when required. The KDL-32EX703 also copes remarkably well with upscaling, even with low-quality standard-def Freeview broadcasts, producing very little block noise. Unsurprisingly, performance with HD broadcasts and Blu-ray discs is even more impressive. Thanks to TruMotion, fast-paced motion is smooth with hardly any judder. Black levels are average: the edge-lit LED lighting offers a decent reproduction of dark scenes, but fails to cope with differentiating between different shades. After the outstanding list of specifications and the stunning picture performance, the audio comes as something of a disappointment. It's by no means the worst sound performance we've experienced on a flat screen panel, with the mid-range proving to be clear and bright, but the distinct lack of bass really lets it down. There is a pseudo-surround sound mode, but this doesn't really bring much to the table. While it's true that £900 is relatively expensive for a 32in panel, you'd be hard pushed to find a similarly sized set with such an impressive list of features and a fine performance to match (perhaps with the notable exception of some of Philips' high-end sets). 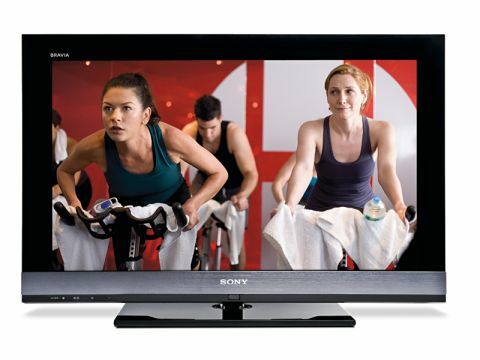 It may be a bit steep, but if you can spare the entry fee then the Sony KDL-32EX703 is one of the best 32in TVs that money can buy.